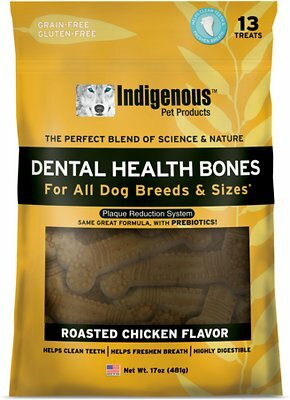 Indigenous Pet Products Roasted Chicken Dental Dog Bones clean your pup’s teeth while he enjoys a delicious snack. These chews are made with Ascophyllum nodosum, a natural kelp harvested from the clean North Atlantic seas, for a natural and rich source of nutrients that’s free from artificial colors and preservatives. 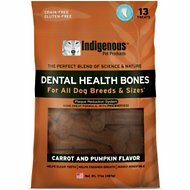 Each unique edible bone is designed to fight plaque and tartar build-up while your dog chews. 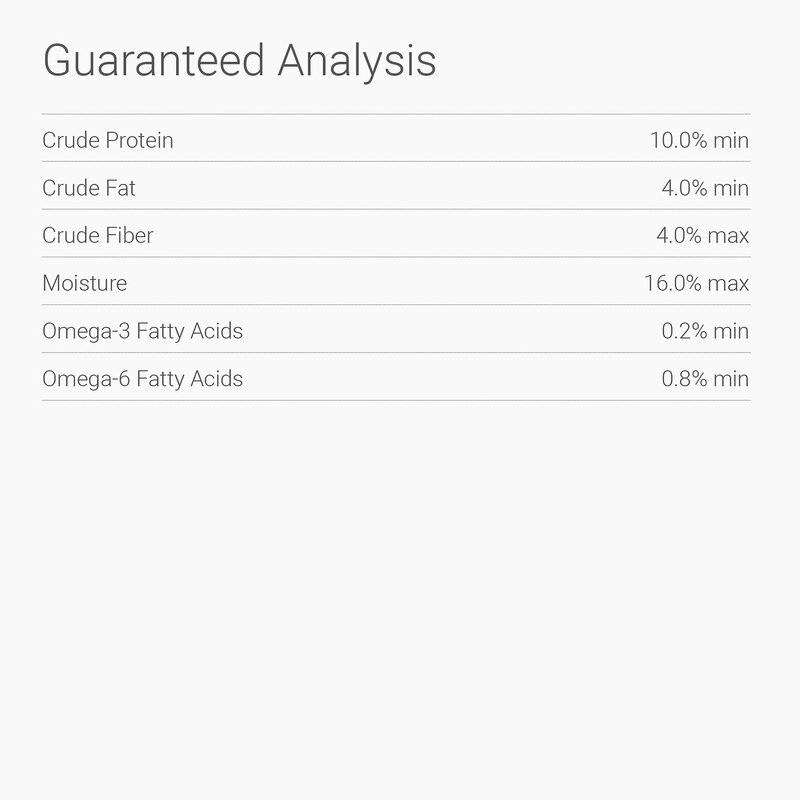 These treats are highly digestible and made with only the best natural ingredients, which means no grain, gluten, or GMOs—and they’re scientifically formulated and made with pride in the USA for the perfect blend of science and nature. 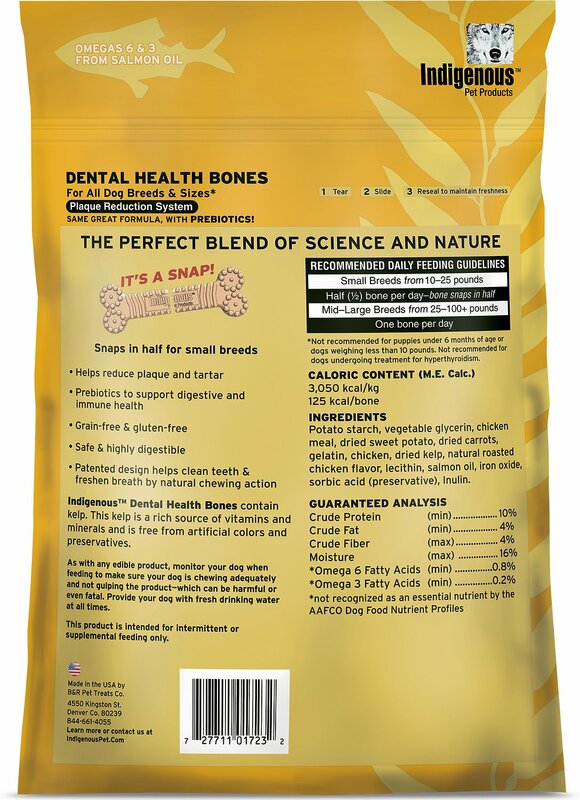 Delicious roasted chicken bones are made with healthy ingredients for a safe and highly digestible treat. The unique shape can be snapped in half for small breeds, and is designed to remove plaque and tartar. 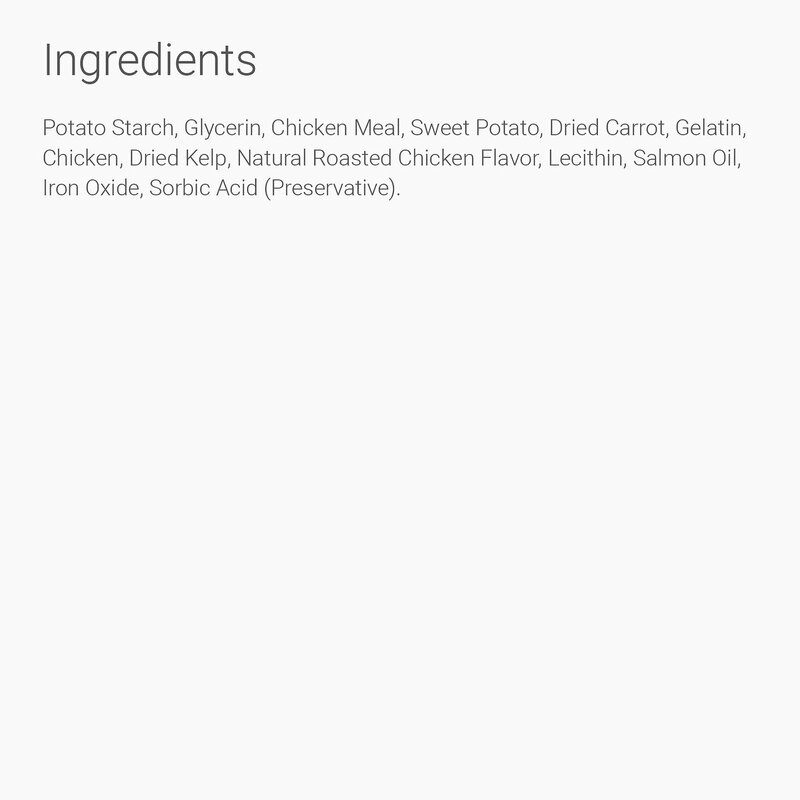 Potato Starch, Glycerin, Chicken Meal, Sweet Potato, Dried Carrot, Gelatin, Chicken, Dried Kelp, Natural Roasted Chicken Flavor, Lecithin, Salmon Oil, Iron Oxide, Sorbic Acid (preservative). *Not recommended for puppies under 6 months of age or dogs weighing less than 5 lbs. 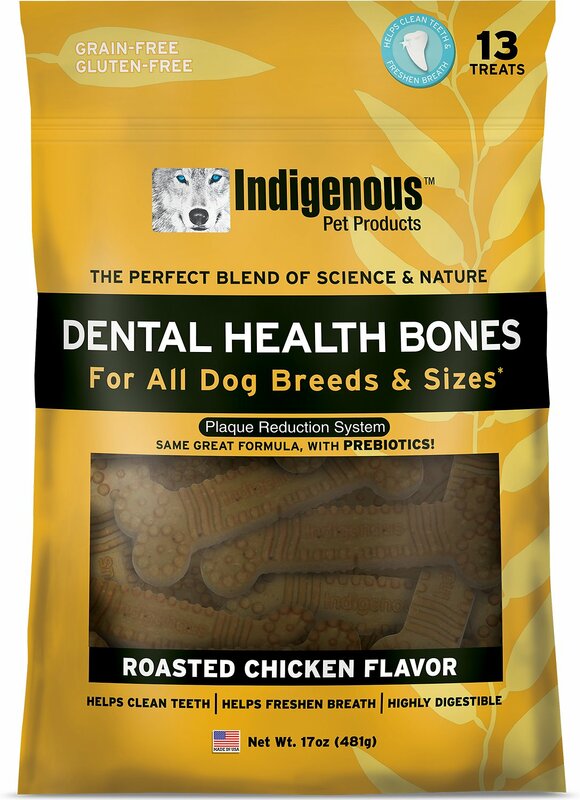 Wonderful Brand, Our dogs love it and we feel very comfortable feeding our dogs ALL Indigenous Products. I thought it would be more meat or bone tasting. Instead as all dental bones, artificial smelling and looking. My Panzer loves them, however...I went to the vet for his comprehensive exam and brought the dental treats that I give my Panzer with me and he advised me that unless the treat has the "VOHC" seal on it that proves it is effective in removing tarter/plaque, it is not worth giving to your pet. This treat came highly recommended on a forum I belong to on Facebook, but did NOT have the seal of approval on it. 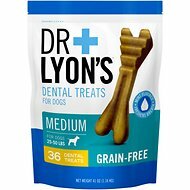 My dog simply loves these dental bones, and his vet cannot believe how white they keep his teeth. He is also very lovable and never has even the slightest hint of bad breath. Highly recommended! Our pup loves these dental chews. I wanted to find a replacement for the Greenies after hearing that the were not as healthy as I thought. I am good with these so far. My dog has to take her time to chew them (a good thing) and she seems to enjoy it. I think that it has helped in the cleaning of her teeth, but I've only been using them for a month. I do not give them out every day, maybe every other day. I would recommend. Sierra really likes these and her breath is better. Also her teeth look whiter. Perfect match for my dog's sensitive stomach.Always looking forward after each meal,also cleans her teeth.